I love decorating for Christmas. No surprise there, right? This year holds a little more meaning in the decorating department since I’ve incorporated a number of my own DIY projects. 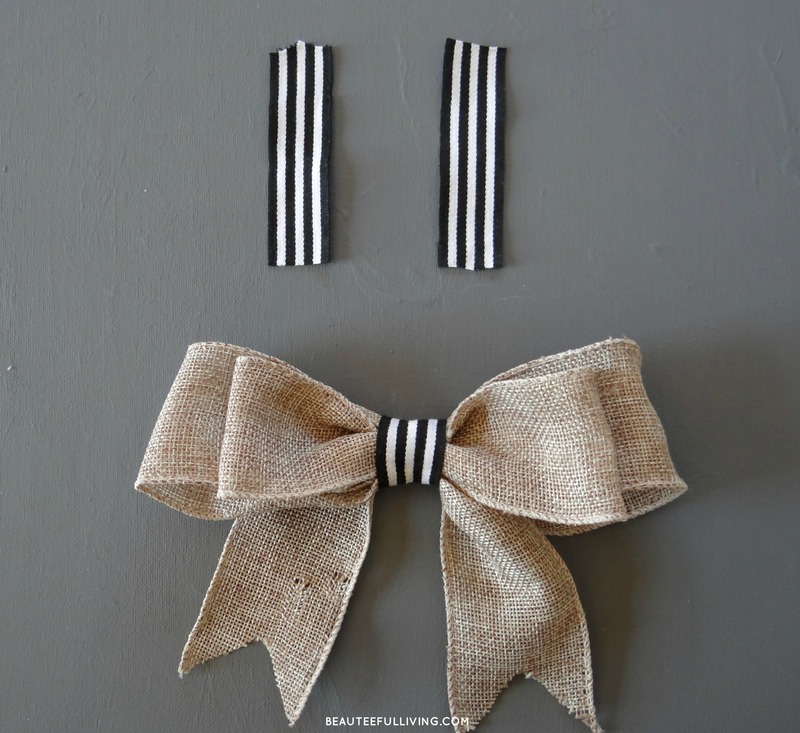 Would you believe a black and white striped ribbon was the inspiration behind most of my Christmas projects this year? 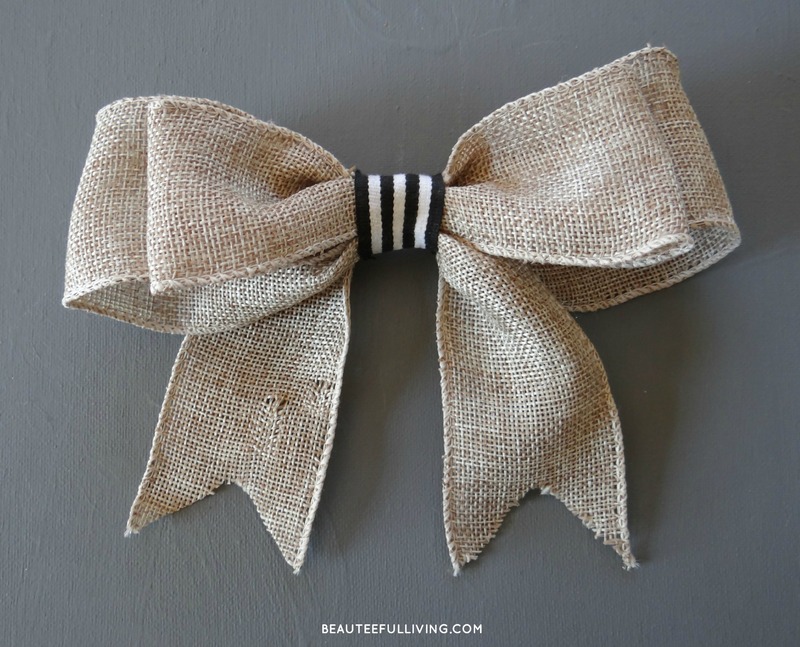 I used it to enhance a simple burlap bow. 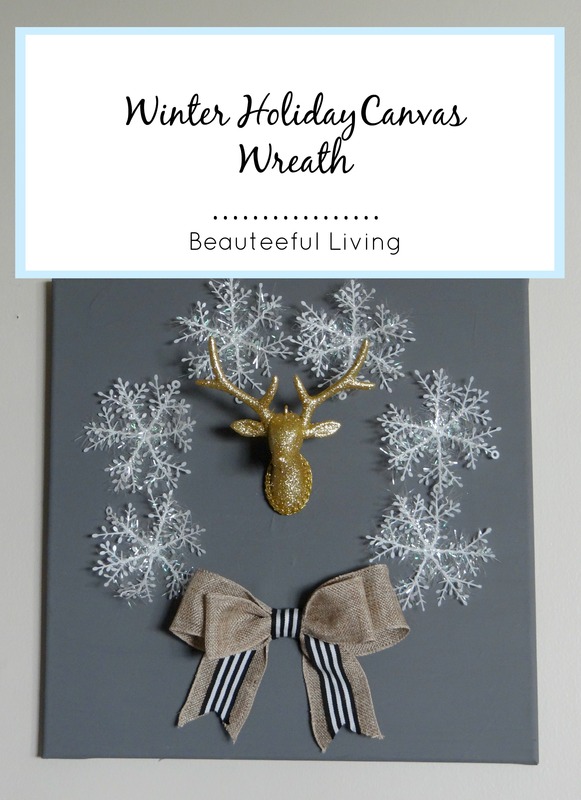 Today, I’m excited to share a “Winter Holiday Canvas Wreath” I created as part of the “Home for Christmas” Blog hop, hosted by Hometalk.com and CountryLiving.com. For this project, I used a square canvas (15 1/2 By 15 1/2 inches). 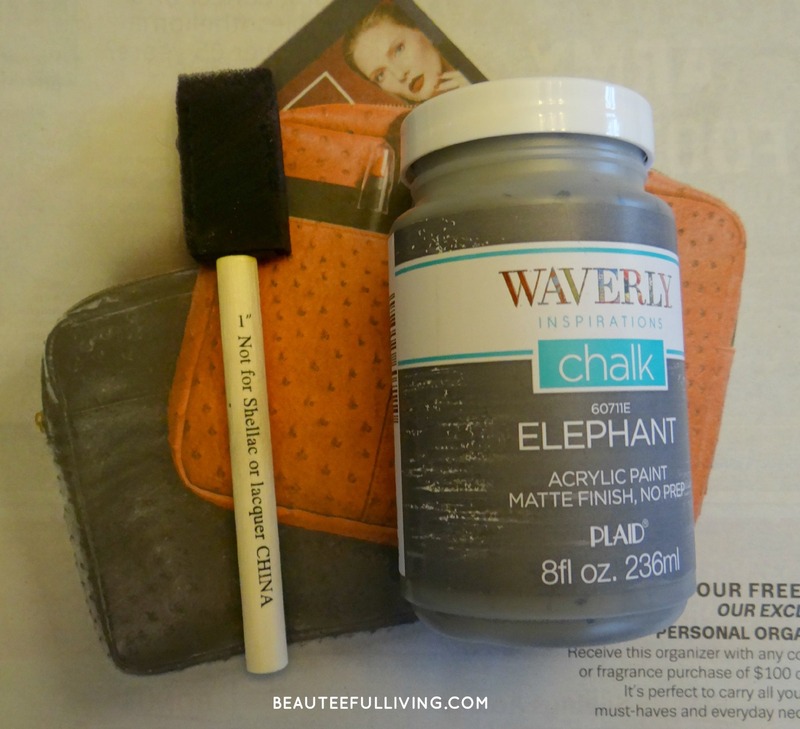 To repaint the canvas, I used a sponge brush to apply the Waverly brand chalk paint (purchased at Walmart). “Elephant” was the name of the color. 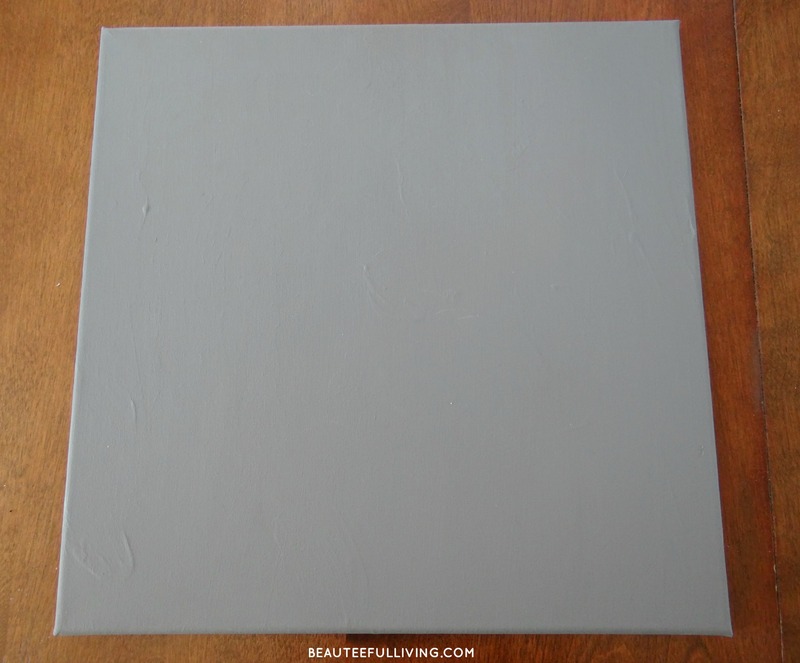 After 2 coats of paint, your canvas will look like the below photo. 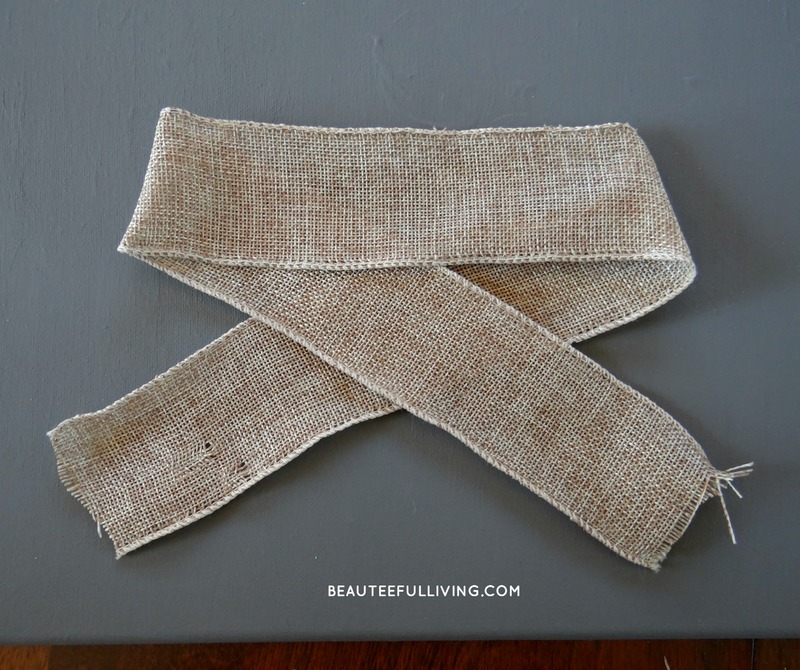 You will need to cut 2 Burlap Wire Ribbons (Long strip to measure 26 inches and shorter strip to measure 14 inches). 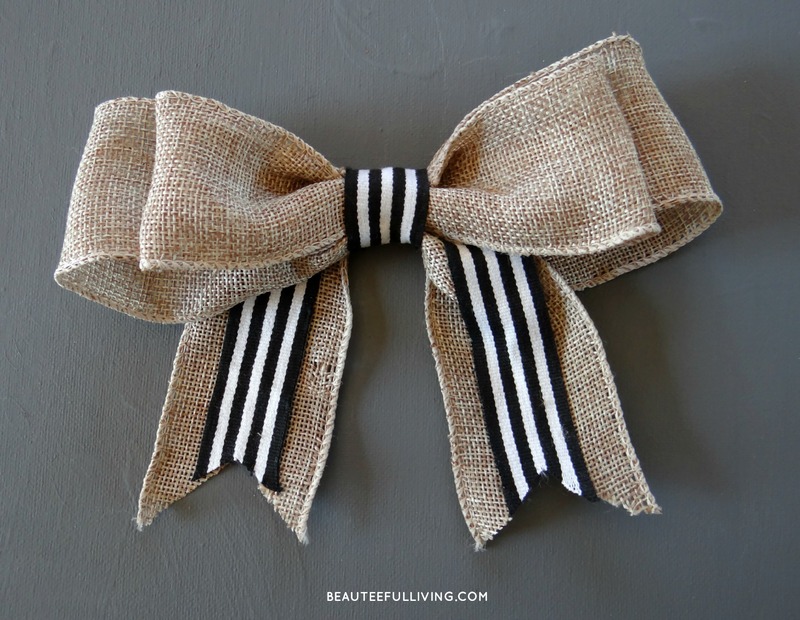 To hold the bows together you will also need to cut a “3 inch” length ribbon (I used black & white striped ribbon) to wrap the burlap pieces together. 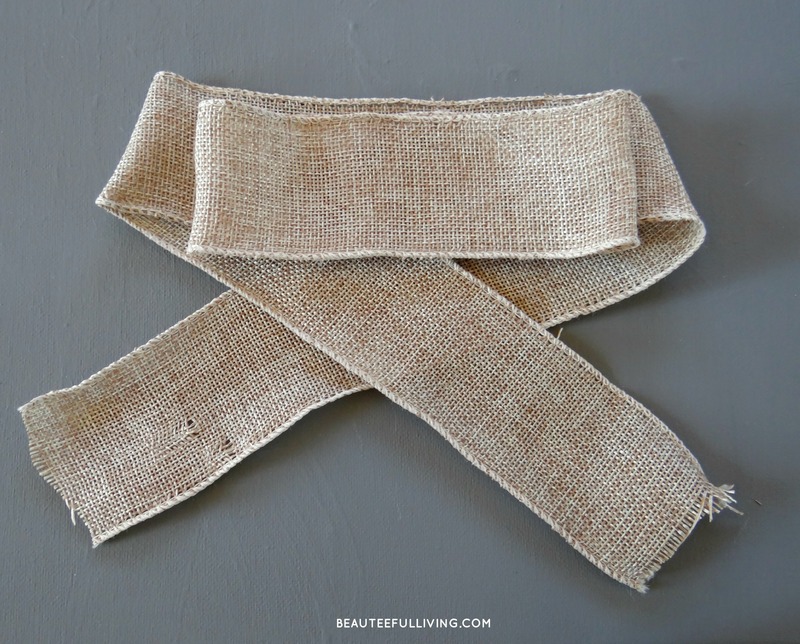 Step One: Grab the long burlap ribbon piece and form shape like below image. Step Two: Fold shorter ribbon piece so that the ends meet each other. Place short ribbon on top of long ribbon. Step Three: Cinch tops of bow. Step Four: Add plastic tie to secure bow. 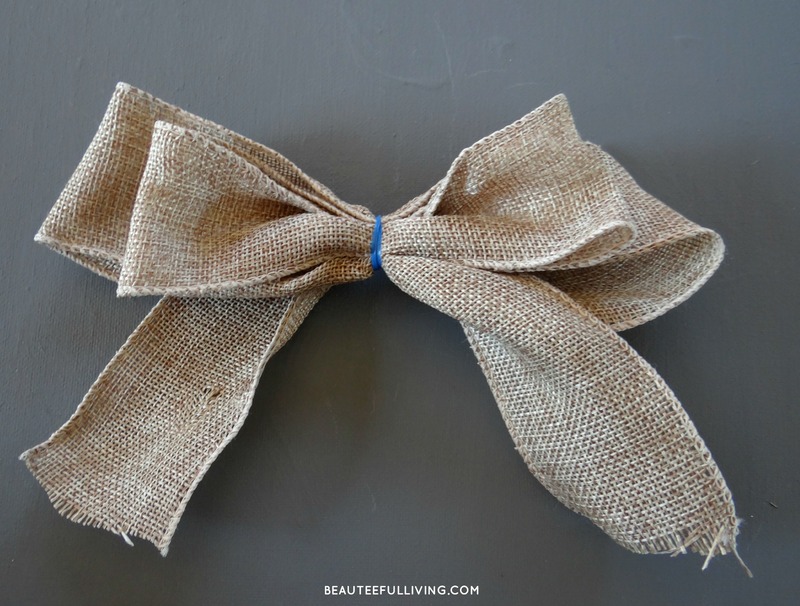 Step Five: Wrap short “decorative ribbon” around burlap bow pieces. 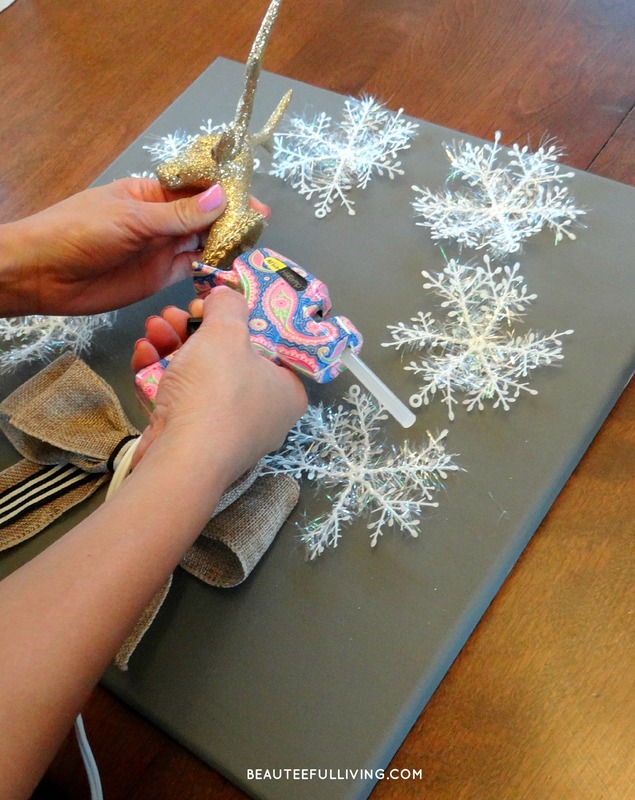 Use glue gun to secure ribbon. Using scissors, cut ends of bow like image below. 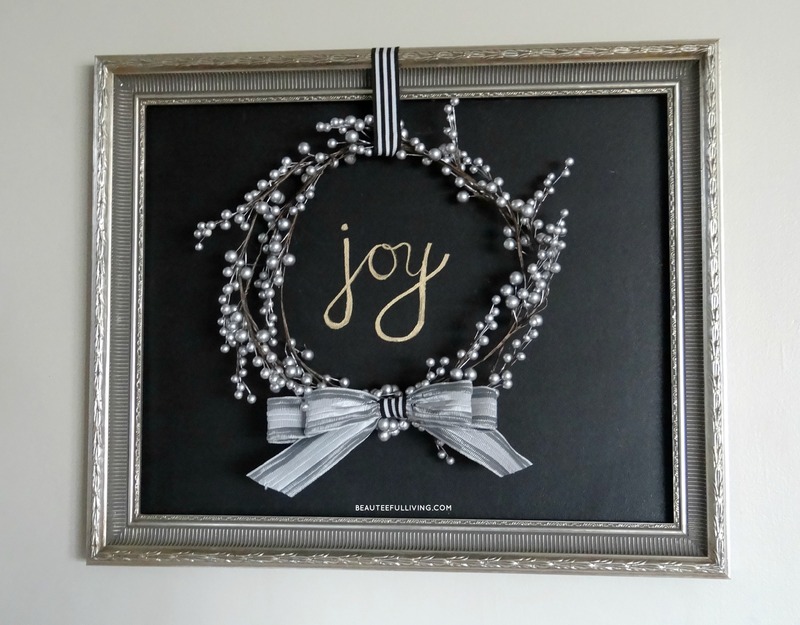 Optional Step: If you want to enhance your bow further, simply add 2 extra pieces of your “decorative ribbon.” Use glue gun to affix pieces. 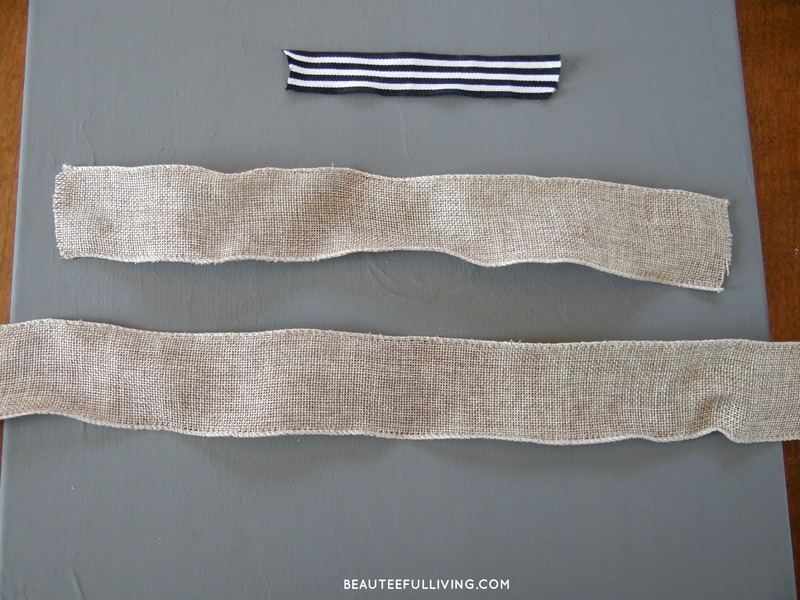 The strips were each 3.5 inches long. P.S. I purchased the Deer head ornament from Walmart. The snowflakes were purchased several years ago from the Dollar store. Nothing like a handy dandy glue gun to put everything together! I hope you’ve enjoyed this DIY project. Please bookmark or PIN this post. You’re the best! By the way, here’s a sneak peek of another project I did for Christmas. I’m a little hooked on making bows lately! I love this! It looks so classy. I am doing this. Thank you for showing how. BTW, your website is gorgeous! Thanks so much for your sweet words, Teri! I’m so glad you enjoyed this tutorial. This looks sooo great!!! What a fun idea! I was so excited to see the huge amount of link ups for this hop! There is so much eye candy!! 🙂 Pinned!! I love this project – so simple and yet so elegant. 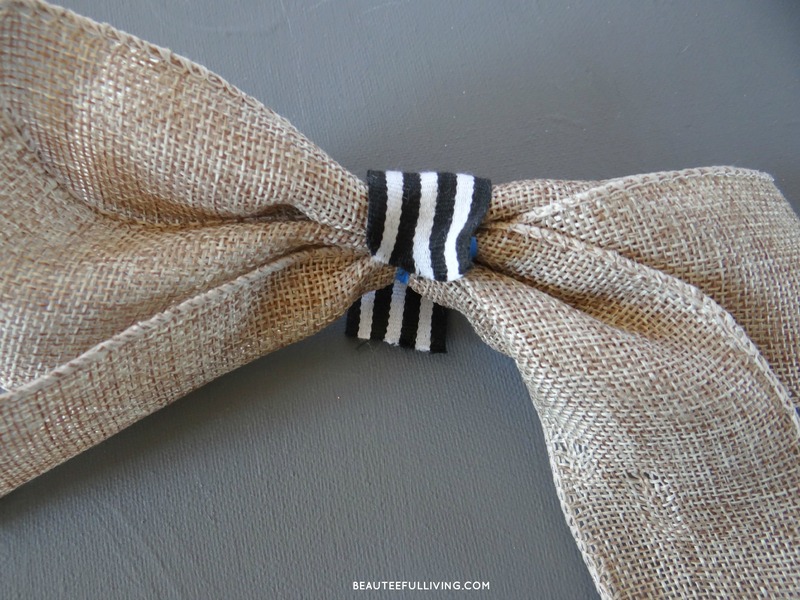 Love both of your projects and how you added a second layer to the bow. I would never have thought to do that. Thanks for the inspiration! This is so cute! 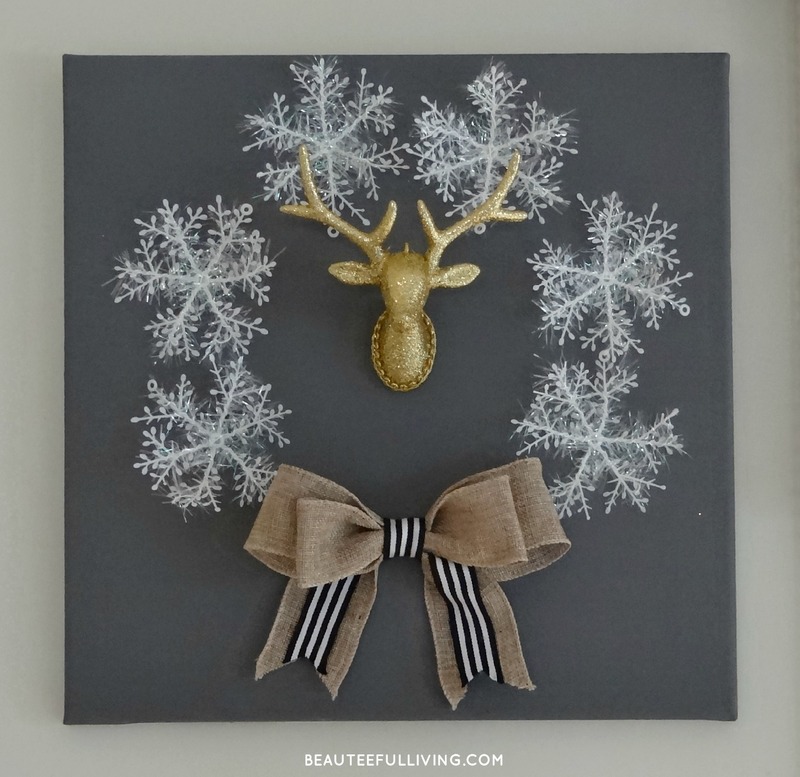 I am really feeling the reindeer decor this year and I love everything about this! This looks great! I love the snowflakes! Tee, I LOVE this. I’m not a fan of traditional wreaths, but this is fantastic. Pinning! 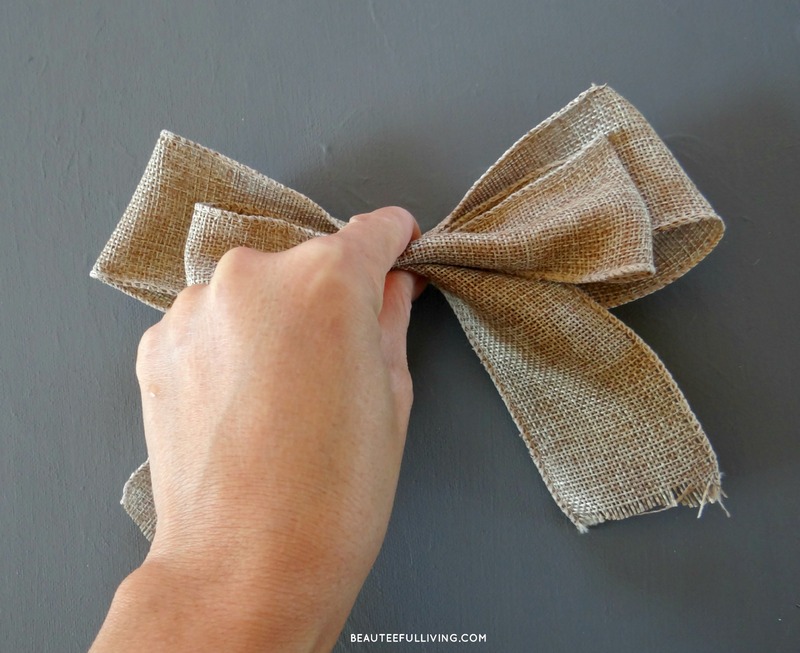 This looks gorgeous, and such a great way to repurposed the canvas! 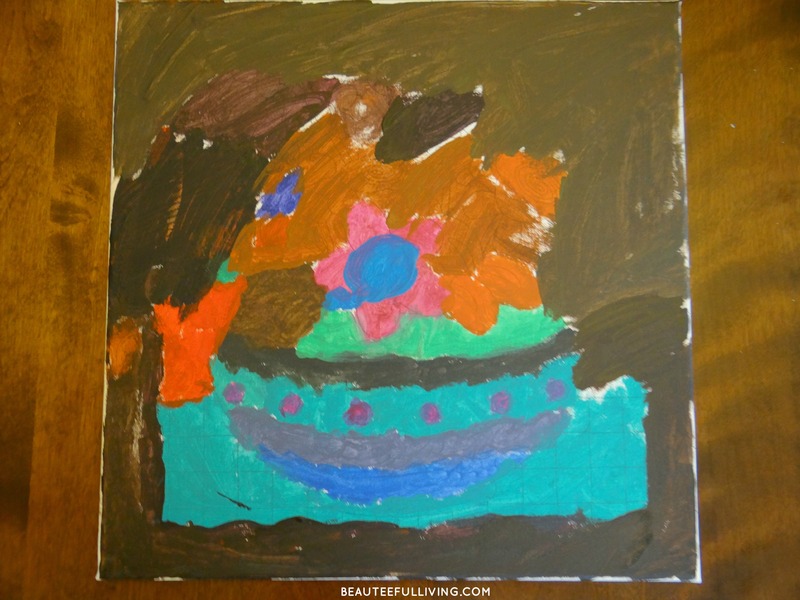 Thanks for stopping by the blog, Angie. What a great idea! 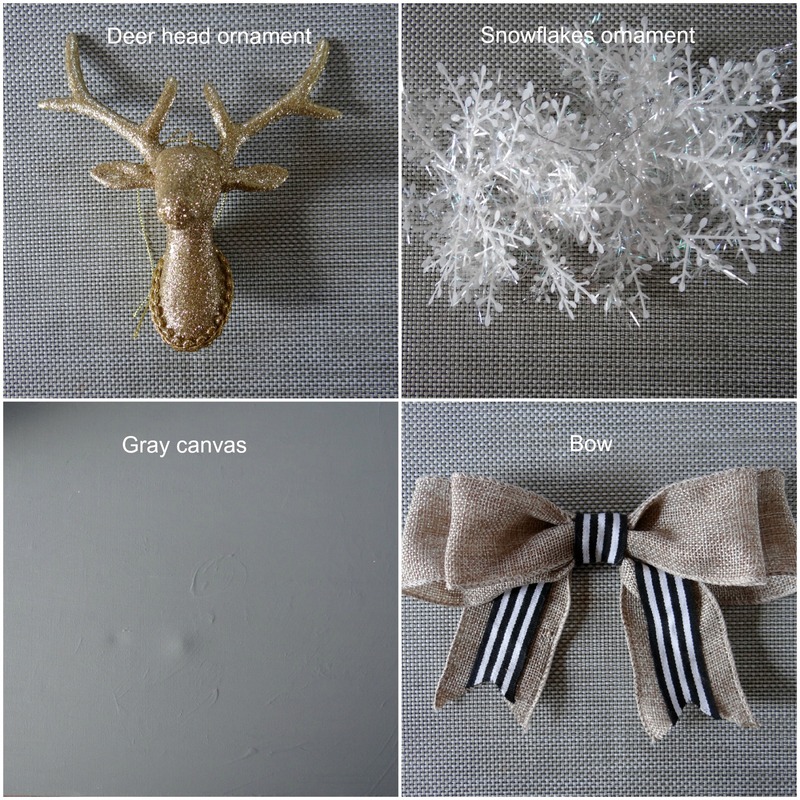 I have about 100 snowflake ornaments in my attic from our last house and never would have thought of this! Thanks for the inspiration! Thanks so much for your sweet comment, Karen! Beautiful….love the black and white ribbon. Lovely tour. This is SO cute and creative! We’ve Pinned it! Happy to tour with you! Thanks so much! I appreciate you ladies for pinning! This is a great project! Good job! I appreciate your kind words and wonderful feedback on the tutorial! Thanks, Cathy. This is adorable, love it! Pinning!